A “NEW uprising” of young leaders at this year’s Summer Camp, run by Ignite Youth, a national youth-based ministry in Brisbane archdiocese, helped it be “the best-run one yet”. Ignite Youth director Kym Keady praised the efforts of “a surge of a new generation of leaders” at the end of last weekend’s camp. Summer Camp has been held since 2013 but was known as Zero Gravity from 2007. 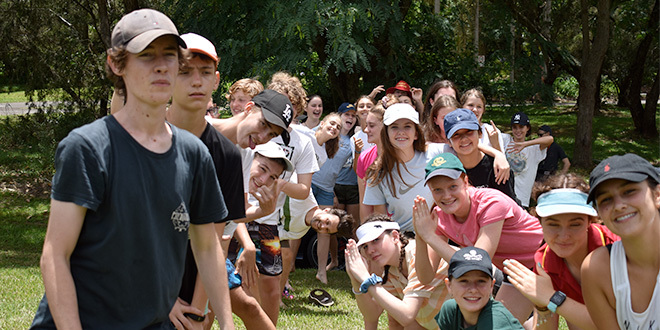 This year the 60 new leaders praised by Mrs Keady navigated the 162 high-school-aged campers, from as far as Perth, through four days of vibrant and prayerful faith-sharing from January 10-13 in Mapleton, on the Sunshine Coast. “It’s so encouraging to see such passion and joy in these leaders who impressed me so much with their giftedness and zeal for ministry,” she said. “I was also grateful for our other leaders who have now moved to the next stage of being more mature and experienced leaders, mentoring many of the younger ones. Mrs Keady said Ignite Youth had developed strategies to keep faith-filled teenagers connected to the Body of Christ. “We worked hard on giving tips of how to know you are not alone in this experience of faith,” she said. Such initiatives include the annual Ignite Conference in September, with its launch at Movie World, and ongoing Friday Night Live events, the first of which is on February 22 in Brisbane. Parents too are invited to connect with Ignite Youth on February 8 “to talk about the joys of parenting teenagers” while Ignite High will be offered nearby and at the same time. Youth can attend these events without having experienced Summer Camp as Ignite Youth welcomes newcomers. Mrs Keady was pleased so many young people would begin the school year with a stronger sense of their identity as children of God. “To start the year with a teenage camp really helps (teenagers) with an insight of what’s ahead and to develop their resilience,” she said.